From the 30th of October to the 7th of December, illustrator Mitch Miller will be resident in Market Gallery on Duke Street. His task will be to create a large room-length ‘dialectogram’ of the stretch of Dennistoun’s main high street that lies between Bellgrove and Duke Street railway stations. Aided by a team of volunteers who will gather information and assist his research, he will work continuously on the drawing in an open studio format, where members of the public will be encouraged to drop by, share stories and if they so wish, contribute their own knowledge and experiences to the dialectogram. But what exactly is a dialectogram? The word is entirely made up, so don’t worry if you have never heard of it before! A dialectogram is a large, detailed drawing of a place – a mixture of map, architectural plan, comic strip and diagram – that documents the lives, histories and relationships between Glaswegians and their city. The drawings collate personal accounts, feelings about place, local knowledge and the impressions of the artist to create a unique social and aesthetic document. The approach has already been used to create a visual legacy for the Red Road Flats as part of the Red Road Cultural Project (now acquired by the People’s Palace Museum), and to record the living arrangements of Miller’s own community, the travelling showpeople of Glasgow’s East End. He is working elsewhere in the city on subjects as diverse as traditional working-men’s pubs, Glasgow Green and student protests. 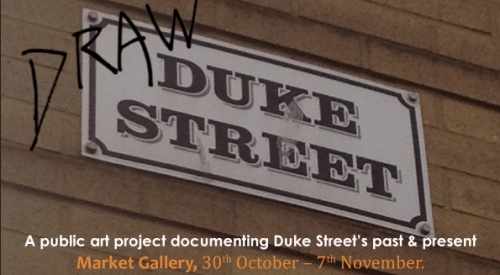 With Draw Duke Street Miller’s attention turns to his local high street (he lives two minutes away from it, on Craigpark Drive), its history, and its current situation – poised between a double dip recession and the massive changes to the East End heralded by the 2014 Commonwealth Games. During his collaboration with Market he will contact all of the shops, pubs and public facilities between the Cooperative funeral parlour at the corner of Bellgrove and the Tattoo parlour across from Duke Street Train station and invite them to take part. Local people, interest groups and the local community council will also be invited to contribute ideas, memories and thoughts to the drawing, which will consist of a strip of A0 panels fitted together as they are completed. When the 7th of December comes, no matter what level of completion the drawing is at, all work will stop and the gallery will open as a week-long exhibition, running from the 7th-17th December. Mitch will again, be on hand to answer questions and talk to visitors about the drawing. The residency will also play an important part in his AHRC-funded PhD research at the Glasgow School of Art. 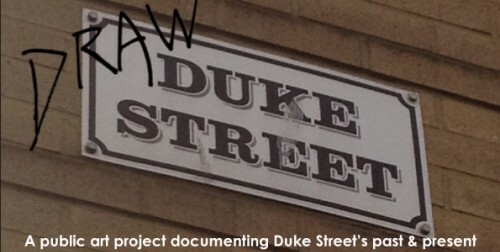 If you are a regular visitor to Duke Street (or for that matter, a first timer with lots of first impressions), a local resident or work there, we would be delighted to hear from you. You can email at glasgowdialectogram@gmail.com, contact Market Gallery or, between the 30th October and 7th December, simply stop by the gallery where Mitch, and an ample supply of tea and coffee will be working 6 days a week. A team of volunteers will also be out and about, so you can also speak to them. You can also check in on the Glasgow Dialectograms website, where examples of previous dialectograms can be seen at dialectograms.co.uk/the-archive. Many thanks for the mention! I now, due to my own stupidity, have to point out that I’ll actually be in the gallery until the 7th of DECEMBER – I made a mistake on the flyers! Would be delighted to meet community members at the gallery though! Thanks for the confirmation, Mitch. The post has been updated accordingly.